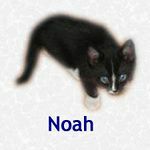 Noah adopted 12/20/04. What a ride they had... Raising kittens in a boat seemed safe this time of year but not when the boat embarks on a voyage up I-5. Luckily a following motorist noticed a cat on the diving board of the cruising vessel and everyone was pulled over to safety. These stowaways are ready to sail into homes and families of their own.